It just got a little easier to find what you’re looking for. 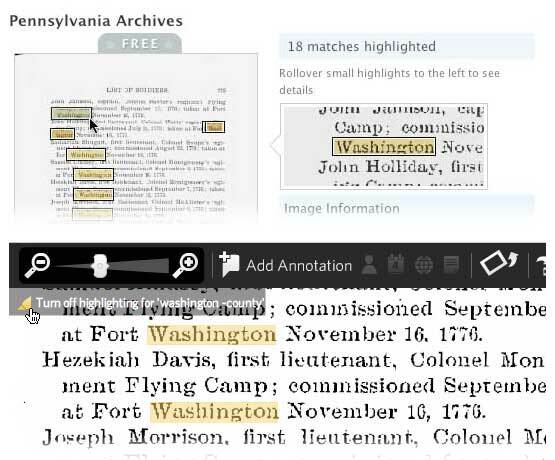 Now you can see where your search terms appear on a document, say The Pennsylvania Archives (free), right on the search results page. Rolling your mouse over any of the highlights in the thumbnail will show you a enlarged view of the word to help you quickly evaluate the document. This feature is available on both free and premium documents where text matches can be found. In the viewer, you can quickly toggle the highlighted matches on or off. For those interested in a little hack. You can edit the URL at the top of your browser to highlight matches for other words as well. Just change the word next to “query=” found at the end of the URL. Be aware that finding words in printed text (commonly referred to as “OCR”) is not a perfect science especially when that text is blurry or warped. For those who enjoy sharing their research and stories with Pages, you’ll be glad to know that you can now reorder your entries with a simple drag-and-drop. Click and drag the entries into the order you want. Leave us a comment if you have any suggestions or things you’d like to see on Footnote. Footnote just keeps getting better and better! I tend to get lost in your site just reading all of the interesting documents I find…I usually log on looking for something specific, but end up having fun browsing and reading. Great site. Glad you found the site engaging. Although I can’t talk about specifics, yet, I am confident there will be content and features coming soon that will address your specific requests – maybe even those that hail from Texas.